Easy access, close to all amenities: supermarket, hospital, doctors, in the center of a provençal tourism, between sea and mountain. 'L'olivaie' is a very beautiful modern villa with every comfort, ideal for your holidays, a distance from the summer overpopulation of the seaside. This rental offers you greater security by the presence of video surveillance of the house as well as parking vehicles. There is also an alarm system in the house. Beautiful Provencal villa with 4 bedrooms, comfortable, with large pool and several outdoor areas for the well being of its visitors: L'Olivaie is located in a city of character to the Provencal identity marked Draguignan is located in a landscape of rolling hills and vineyards. At L'Olivaie, tourists are welcomed within a protected, sheltered from the effervescence on the coast nature, while remaining within easy reach of beaches Var, including the legendary Pampelonne beach in St Tropez . 2 beautiful rooms Water, including one in the master suite. Both are equipped with large glass showers, bathroom furniture bathroom with storage and large mirrors. Presence towels doors. Radiant electric heating in each bedroom and shower room. Dry heating towel in second shower room. Reversible air conditioning in the living room and kitchen. - 2 bath towels per room - 2 hand towels per shower room. Corner sofa with coffee table and two additional seats. Independent boudoir with 2 armchairs and a coffee table. Fully equipped modern kitchen, adjoining the living room. Magnificent landscaped park of 4000 m² planted with Mediterranean species making the tour of the property. Many terraces under the sun and shaded; As well as small places to isolate and spend pleasant moments a little more intimate. INTERIOR: -Living room: 1 corner sofa, 2 armchairs toad, 1 coffee table, 2 libraries. LCD 117 cm, TNT, DVD player, HI-FI channel. -Dining room: rectangular table, 2 benches. -Fitted kitchen: with dishwasher, oven, microwave, 1 hotplate, fridge-freezer, washing machine 9Kg, toaster, coffee maker and electric kettle, various accessories, storage. -4 Rooms equipped with beds 160X200, bedside tables and lamps, wardrobe closet in each room. -2 Bathrooms including one in parental suite. EXTERIORS: 160m² of Terraces: -TERRASSE COUVERTE living / dining room 30m², facing South, including a teak table and its 08 chairs. -TERRASSE kitchen 35m² -TERRASSE under pergola 15m ², equipped with two armchairs and table. -TERRASSE 50sqm summer kitchen:, with braided resin garden furniture, BARBECUE / PLANCHA -PISCINE 10X5, with footbath / shower, paved terrace, 8 sunbeds, 2 umbrellas, ping-pong table. We very much enjoyed our stay in L'Olivaie villa. Two families, 4 adults and 4 children, found there a nice environment for both relaxation and also very nice spots to see in the near surroundings. We made short trips to very close cities/villages of Tourtour, Villacroz, Flyosc. One can also reach Canyon du Gordes. There was everything one can possibly think of in the villa. Four very nicely designed bedrooms, indoor and outdoor kitchen. Petanque court and swiming pool. A nice dining table in front of the villa, just by the swimming pool with lights in the evening made our dinner atmosphere and also midnight swimming was possible. The owners were very pleasant and helpful. Very nice house and garden! Very nice house and garden! Stayed two families with kids from 1 to 9 for one week in July 2018 and had a great time! Garden and pool was very nice and enjoyed by the kids. Liked the outdoor kitchen and different seating and dining areas outside. House is nicelly furnished and bedrooms have good size comfortable beds. Owner is very attentive and nice! Thanks Thierry! Merci Simen pour vos compliments, nous avons été heureux de vous accueillir à la villa l'Olivaie. En espérant vous revoir un jour. In een woord schitterend ! Villa L'Olivai is heel goed gelegen , met een verzorgde tuin , kort bij het centrum , bakker en warenhuis . De ontvangst was vriendelijk enc orrect. Groot proper zwembad , met binnen en buitenkeuken . Wij hebben er een week genoten met onze kinderen en kleinkinderen . Wij hadden prachtig weer met hoge temperaturen , misschien een tip om airco op de slaapkamers te installeren. Merci pour vos commentaires et au plaisir de vous revoir à l'Olivaie. Un Grand Merci à vous.... Mais très sincèrement ce fût un grand plaisir de vous avoir à L'Olivaie.. Un petit mot tout spécial pour mon petit copain qui m'a beaucoup aidé.... Vous êtes une famille harmonieuse que du bonheur. Peut-être nous reverrons nous, ce sera avec grand plaisir. With 40mn of St TROPEZ, 40mn of Cannes and 30mn of the Sea. 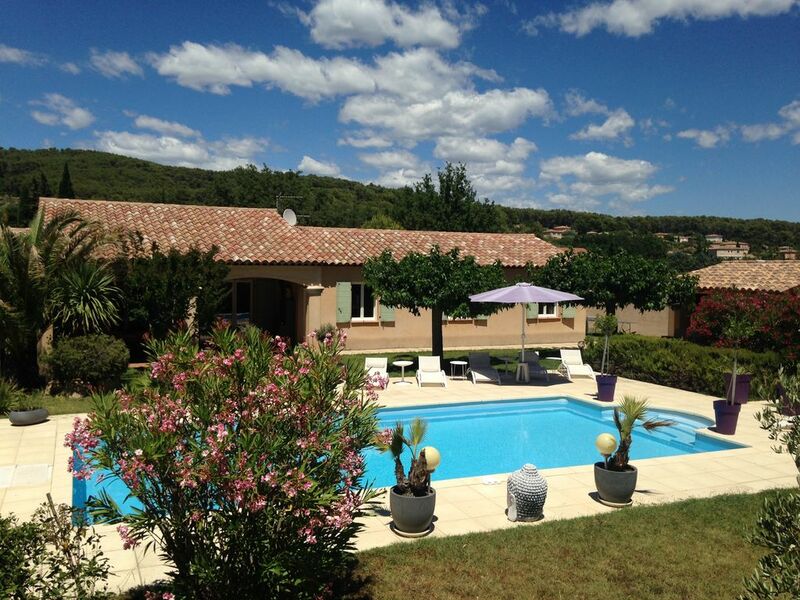 Located on the commune of DRAGUIGNAN, in the department of the VAr (83). - GORGES OF the VERDON its canyon and its majestic cliffs. - SAINT TROPEZ his JET SET and his beaches of Pampelonne. - SALERNE and its famous earthenware. - TOULON and its roads. - CANNES, NICE and MONACO with some encablures. Trade and supermarkets in the vicinity (2Km). Paiement : Un contrat de location saisonnière vous sera adressé, les réservations deviendront définitives après retour du formulaire signé et accompagné de l'acompte de 50% réglé en euros, par chèque ou par virement bancaire. Le solde du loyer sera versé 1 mois minimum avant l'entrée dans les lieux loués, ainsi que le règlement de 150€ obligatoire pour ménage de fin de séjour.